Make huge savings on graphics tablets and Bamboo digital art tools now. Digital artists are in for a treat this Bank Holiday weekend, with Amazon hosting a huge sale on Wacom and Bamboo gear. 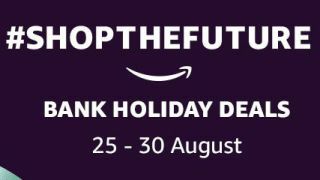 That's right, by heading over to Amazon's Shop the Future weekend deals page, artists and illustrators can pick up graphics tablets, pens and gadget cases for less. You'll also find deals on the latest cutting-edge electronics, home, health and beauty as well as food and drink products. Let's dive in and see exactly what's up for grabs for digital artists – and how much you can save. First up is the Wacom Intuos Pro Small graphics tablet. Starting at midnight on 25 August and running through until 23:59 on 30 August, this offer sees the popular tablet retailing for just £161.99. That's a 30 per cent discount off the normal RRP. Running over the same time is a discount on Wacom's Intuos Photo Pen and Touch Graphics Tablet small black model. Compared to the tablet's regular price, you can save 20 per cent off RRP and snap it up for just £71.99. This weekend offer sees a huge 42 per cent coming off the RRP of the smudge-free navigation tool. Perfect for smooth handwriting and compatible with most tablets, smartphones and touch screen PCs, this stylus can be yours for just £17.99. There's 46 per cent off RRP to be saved this weekend on Wacom's grey Bamboo Spark Gadget Case. Up for grabs for just £64.99, this is an ideal opportunity to snap up this tool, which turns handwritten notes into digital assets.